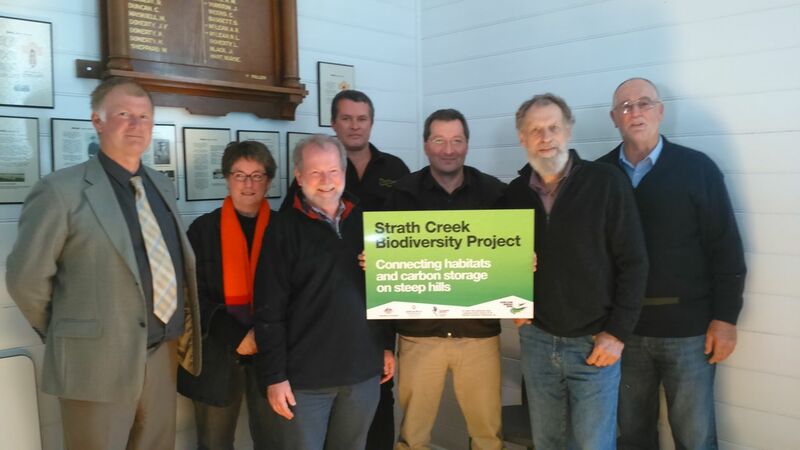 The Strath Creek Biodiversity Project achieved much in the two years it ran, from May 2012 to July 2014. The challenge now is to consolidate those achievements and encourage others to learn from this example. To celebrate and record these achievements we’ve put together a booklet summarizing the project’s goals, methods, partners and outcomes. 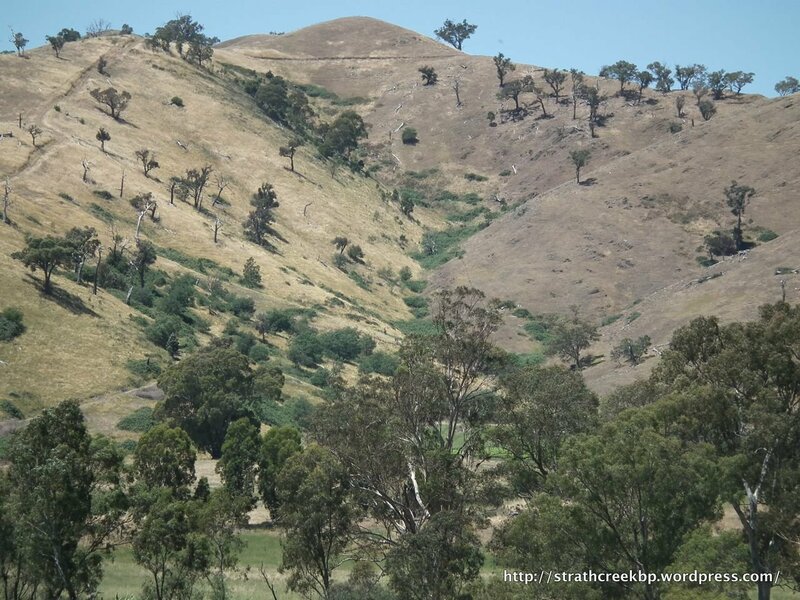 Steve Joblin (Project Coordinator), Kate Auty (Guest Speaker), Ian McKaskill (Upper Goulburn Landcare), Shane Monk (Taungurung), Craig Rubenstein (Strath Creek landholder), David Wakefield (President Strath Creek Landcare), Terry Hubbard (Upper Goulburn Landcare). 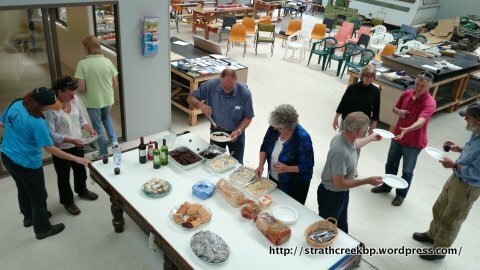 The Strath Creek AGM, held recently, was also the final community event and celebration of the Strath Creek Biodiversity Project. Pictured above, the gate sign for all participating landholders is proudly displayed by Craig Rubinstein, flanked by Ian McKaskill (Project Steering Committee Chair) and David Wakefield (President, Strath Creek Landcare). With the project winding up, the last few months have been very busy indeed. Volunteers, tractors, planting, fencing – all happening under Steve’s watchful project-coordination eye. And if you don’t believe all the rhetoric about steep hills – take a look below. Richardson site before planting, looking towards Tallarook Ranges, 3 sisters on the left. Volunteers planting an eroded watercourse at the Grady/Adshead site. Richardson site looking towards the north-west along the ridge top. The Franklyn Scholar “Certificate III in Environment Studies” group helping with planting- Richardson site. Rick Wheeler, Vice-president of King Parrot Creek Environment Group and proprietor of RAW Plants, Flowerdale, planting ‘his’ seedlings on the Richardson site. Rick planting a corridor to the ridge top at the Richardson site. The steel post is vertical! One-year-old Large-leaf Bush-pea planted into rip-lines without guards. Looking east along the O’Grady/Adshead ridge. National Tree Day with Landcarers and corporate groups Panachocolate and 15trees. Peter Richardson is amazed where some people take their tractors! This 28 ha valley will be rehabilitated with funding from the Australian Government; one of the new project sites. In mid-December two project staff (Steve Joblin & Bertram Lobert) toured several of the existing project sites, as well as a couple of the newly proposed project sites. The object of the tour was to assess revegetation, direct seeding and natural regeneration progress at several of the newly fenced and planted sites and to undertake inspections of the sites recently added to the project. On-site at the creek inspecting project work and discussing management options. 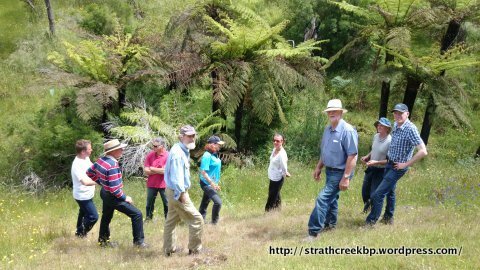 Last Nov. 17th Strath Creek Landcare ran a combined workshop for several local catchment-health projects: the Landcare blackberry action project, our Biodiversity Fund project and the GBCMA’s waterway fencing project. The workshop examined and discussed a variety of on-ground works that the Landcare group and landholders are currently involved with. That so much is happening in this outwardly sleepy valley is a testament to this dynamic group. As always, a tasty lunch and drink were an essential part of the day. Direct seeding of King’s and a Granter surprise. 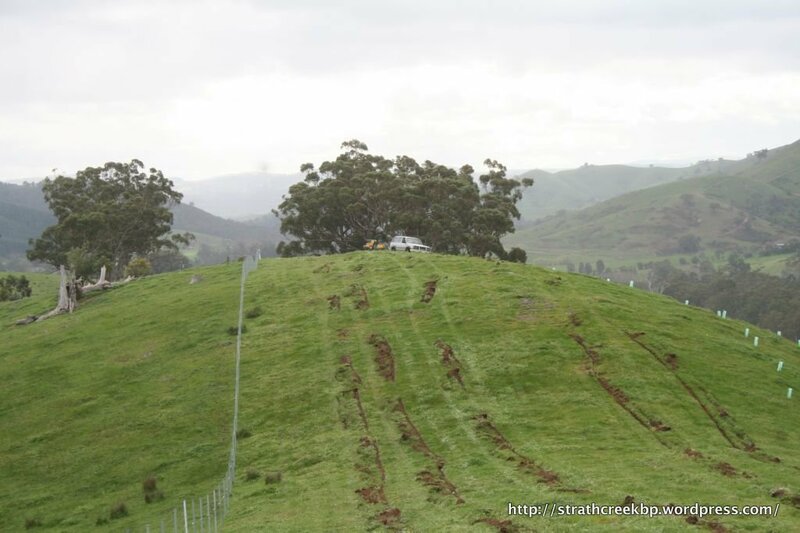 The King site, like most in this project, is generally steep so that most revegetation is done by hand. 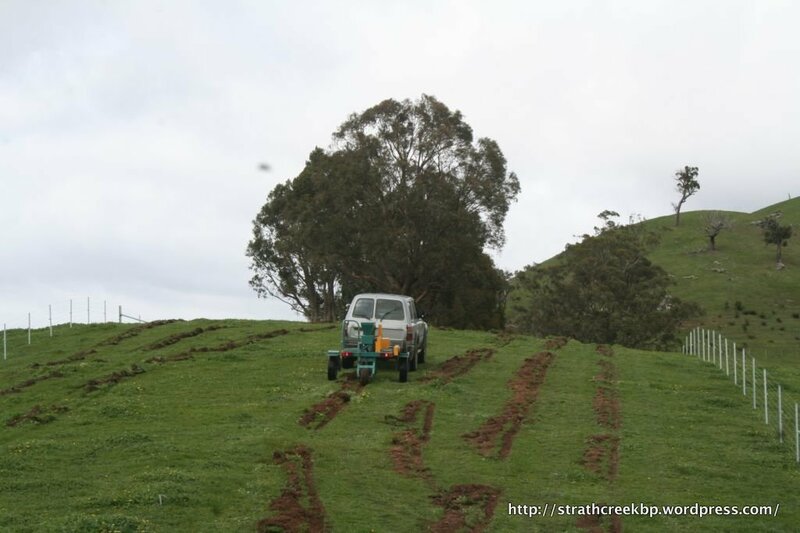 However, the site has a flat to undulating ridge-line, perfect for direct seeding and that’s just what Janet and Justus Hagen got up to a few weekends ago. Here you can see their direct seeding machine being pulled behind their 4WD, scalping the ground where seed is then sown. Direct seeding usually occurs when soil temperatures have warmed enough for the seeds to begin germinating (in theory), though some seeds may not germinate for months or even years – waiting for just the right conditions. In this case the direct seeding was supplementing the ground layer of native grasses and some herbs and the scattered grey box trees. You can find other site pics here and here and here. Looking NE along the ridge-line and the nearly finished direct seeding job. New site boundary & fence-line to the left and white tree guards on the steeper slopes to the right. Later that day, Project Officer Steve Joblin dropped into another of the project sites to check on progress. The Granter site had previously had roof-habitat tiles placed near the location of a Striped Legless Lizard (Delma impar) record (in Nov. 2012). This species is Nationally Threatened and had not been recorded in this district prior to the start of this project. These tiles had been checked on a number of occasions during the year for small skinks etc, but no more legless lizards had been found. However on this day, Steve was lucky! Though the stripes were not as clear as on a previous individuls, it was non-the-less a Delma impar and further proof that the site supports a population of these special animals. Garden Skink (Lampropholis guichenoti), a very common skink across Victoria. Striped Legless Lizard with indistinct stripes and tell-tale yellow cheeks. Same individual Striped Legless Lizard (Delma impar). 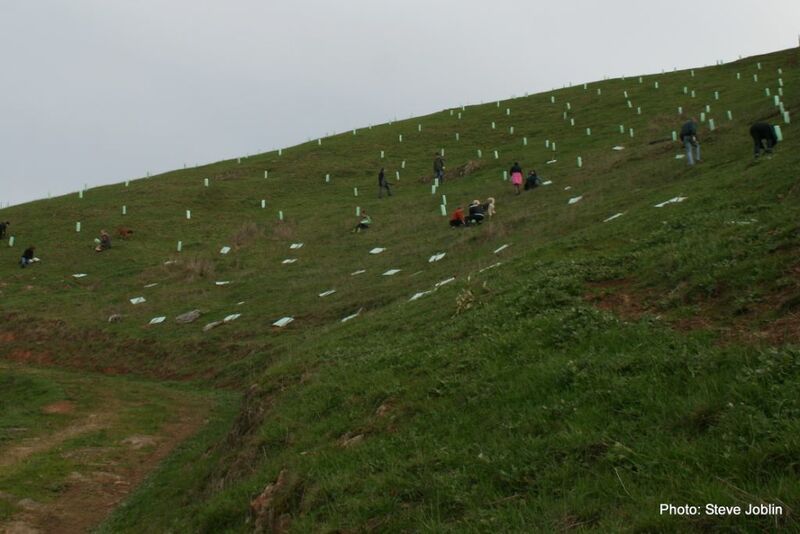 A total of 521 seedlings were planted at Sue and Joel King’s property, by 17 Strath Creek Landcarers (adults) and seven juniors in 2 and 1/2 hours on a windswept slope, slippery with capeweed. Another three Landcarers were doing a fantastic job of catering, which in this case meant gourmet pizzas in the wood fired pizza oven! Joel and Sue now have 20 seedlings left to plant out of 1,000 allocated to this site by the Strath Creek Biodiversity Project. In September, the ridge top will be mechanically direct seeded.